This Thursday, 19 November, is World Toilet Day—a day to celebrate the humble, yet vitally important, toilet and to raise awareness of the global sanitation crisis. Forty percent of the world's population does not have a toilet. In the town where we live in the Central African Republic, 70 percent of the homes do not have a latrine (such as the one pictured above). As you can imagine, the practice of open defecation spreads disease and contaminates water sources. This only complicates the task of the Water Management Project (known as PASE for its acronym in French) where I serve as technical advisor. PASE works with villagers to teach them proper hygiene and helps to provide sources of clean drinking water. We would like to also improve sanitation in villages, but we are limited by lack of funding and personnel. In a country such as the CAR, which has so many problems, most people are not concerned about sanitation, so the first step is raising awareness of the problem. Thank you for your support of our program, during these times of continued financial difficulties throughout the world. 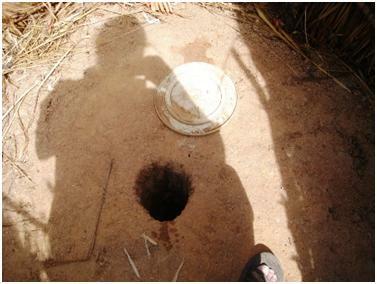 Photo: The photographs above are of an improved latrine. The walls are about 1.5 meters (5 feet) high. The hole is about 15 cm (6 inches) in diameter, with a plastic lid to keep the flies down. The dirt floor around the hole is mounded, so that rainfall runs away from the hole. Joe and Deborah Troester are ELCA missionaries in Baboua, the Central African Republic. Joe serves as technical advisor for PASE, which provides clean drinking water and promotes good hygiene and sanitation to villagers. Pastor Deborah teaches at the Theological School in Baboua. I must to say this blog catched my attention for all the interesting information that contained. i really liked, i think all this information are very useful and . i really enjoyed reading. I am a curious person, but i am usually interested just in a good blog like this one.